Life Size Realistic Fake Adult Hands SET Stage Prop Gag Trick Body Parts. Everyone needs an extra hand now and then, and now you can get two! Fun phony pair of Hands make great Halloween horror prop building decorations. Life-like Cut-off hands, perfect for practical jokes or haunted house display. Made of high quality rigid poly detailed cast molded hard PVC plastic. 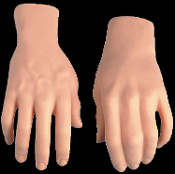 These Stage Prop hands are just what you need to complete a homemade character prop figure and work well when used alone in cemetery graveyard scenes. You will find endless uses with these life-sized stage hands. Thick hollow molded plastic with smooth top wrists. May be painted a different shade if the brighter orange hue won’t work for your indoor or outdoor applications. Hands each measure approx. 9-inch L x 4-inch W x 2-inch thick (22.5x10x5cm). Set of two includes one left and one right life-sized hand. Perfect add on to Stage Feet, available separately. Brand: Forum Novelties.